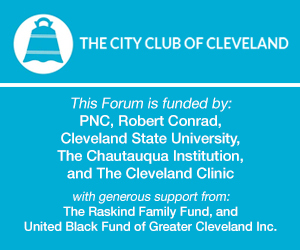 The City Club of Cleveland is excited to have our Friday Forum as part of the TEDXCLESalon event celebrating 100 years of the theory of relativity! Albert Einstein is widely-regarded as one of the greatest physicists of the modern era. His crowning intellectual achievement, General Relativity, still guides us and challenges us 100 years later. We’re excited to celebrate, debate, extrapolate (and maybe even “poke the box” a bit) around Einstein’s work... and what it means for our shared future. City Club CEO Dan Moulthrop will lead a conversation on the legacy of Albert Einstein with Evalyn Gates, Executive Director and CEO of the Cleveland Museum of Natural History, and Cyrus C. Taylor, Dean of the College of Arts and Sciences and Albert A. Michelson Professor in Physics at Case Western Reserve University.